Chesapeake Security Service Co. was founded with the mission of providing the highest quality security services to government, military, industrial, commercial and property management clients in the Maryland, Virginia and Washington, D.C. metro areas. We have equipped our service vehicles with the tools and inventory necessary to bring skilled security expertise to the customer. As experienced security professionals, we recognize the value of stocking a variety of parts and equipment to enable our technicians to provide complete service on the first call. We understand the importance of maintaining the integrity of a secure environment and are committed to providing prompt, comprehensive, cost-effective solutions. The professional focus of our company is to assist our clients with confronting the broad range of physical security challenges that confront them each day. It is important to our clients that they can resolve their security challenges with just one call to one vendor, secure in the knowledge that they are being given the right information the first time. Towards that goal, our continuing education program ensures that our technical personnel are certified and proficient with the hardware and systems we provide to our clients. Moreover, our philosophy is to share that knowledge directly with our clients by viewing each meeting as an opportunity to educate them, ensuring that they are aware of the both the range of options and latest technology available. 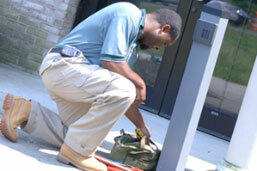 Unlock your career path today with Chesapeake Security. Chesapeake Security is always interested in meeting highly motivated, ambitious, talented individuals that are eager to learn and advance their career. If you have two or more years of directly related work experience as a Locksmith/Security Technician/Certified Door Installer and wish to join a team of highly-qualified security professionals, we would appreciate hearing from you. Experience with Medeco, Mul-T-Lock, LKM, X-10/CDX-10, GSA Safe and Vault Inspections, Door Installations or other industry certifications are desirable. All successful applicants must have the ability to obtain and maintain jurisdictional security licenses and an acceptable driving record. Please complete the job inquiry form below to apply for one of our Locksmith or Security Technician positions today.